Hi, I go to use the 3D models in clips studio paint, but the circle thing that allows you to manipulate the model is gone. The areas on the model light up, red, but I can move it around. Has this ever worked for you (in 1.6.7—assumed)? 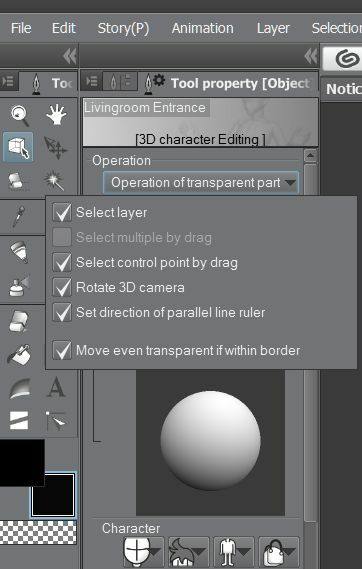 The models should move just for left-click-&-dragging the model regions. They should start out a bluish-purple when hovered over, and turn red once moved. It's curious, but they do seem to have changed the model format. I find that some regions under physics control, seem to ignore manual bone positions—which is a crippling mistake on their part IMO. These only appear to move when displaced by other model regions; (posed limbs). **Disabling the physics simulation does restore control over the affected bones. Also, check to see what operations your Operation tool has enabled or disabled.